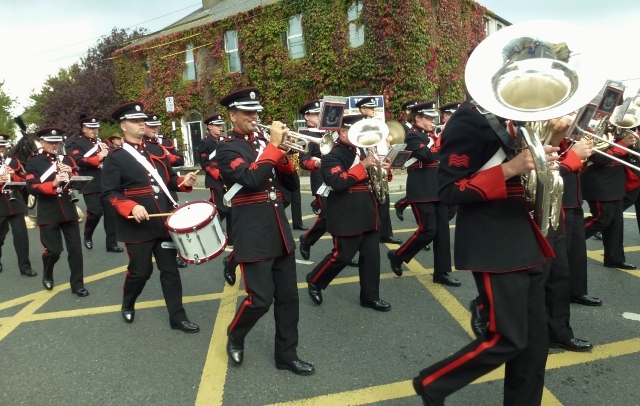 One of the highlights at the start of the recent RTÉ Big Music Week to encourage live music was the parade in Newbridge. It made its way from the train station to the Main Street and then over the bridge across the River Liffey to Patrician Secondary School for an hour-long concert in the school hall. The parade was led in style by the Army No.1 Band from Cathal Brugha Barracks in Dublin. Tomorrow night (Saturday 12th October) they will be performing at the National Concert Hall in Dublin in the annual defence forces benefit concert and the tickets are sold out so there will be a full house. Celine Byrne from Caragh in County Kildare who was also in Newbridge for the RTÉ Music week is the guest soprano. 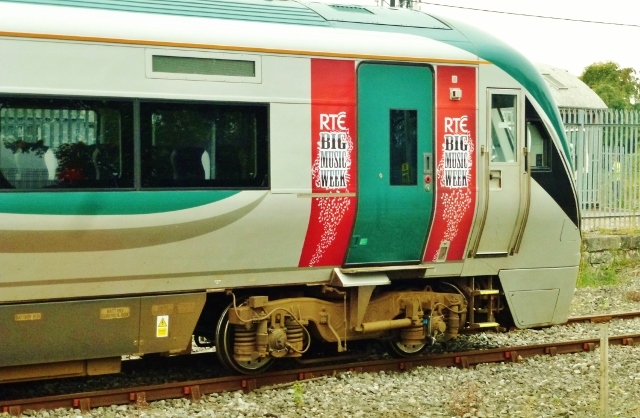 I was delighted to get as far as Carlow on the RTÉ Music Train as I began my journalistic career there as a student in summer 1972 when I worked at the Nationalist and Leinster Times in Tullow Street. My father had begun his career there and had met my mother over 65 years ago. More live music here in a marquee erected in the station car park. Risin’ Time presenter Shay Byrne was the compere this time. Selina O’Leary from Tullow was among the performers as well as the Bugle Babes. After seven hours of varied and continuous live music, it was time to return home, courtesy of Iarnród Eireann as far as Dundalk. 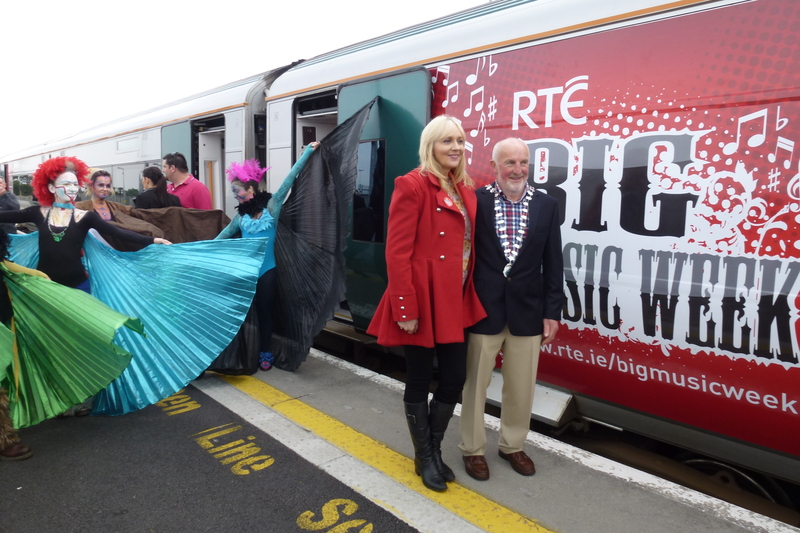 What a fantastic reception in Newbridge for RTÉ’s Big Music Week. Alighting from the train, the musicians, presenters and guests were greeted by the colourful ‘Birds of Paradise’. 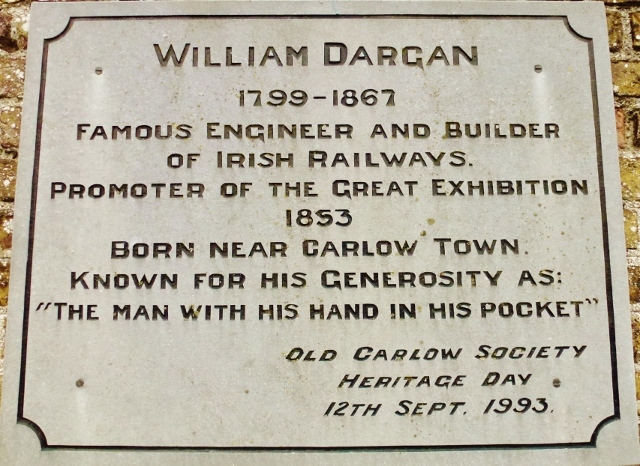 Town Mayor Councillor Mick Deely was on the platform, waiting to whisk Miriam O’Callaghan away in a horse-drawn carriage. 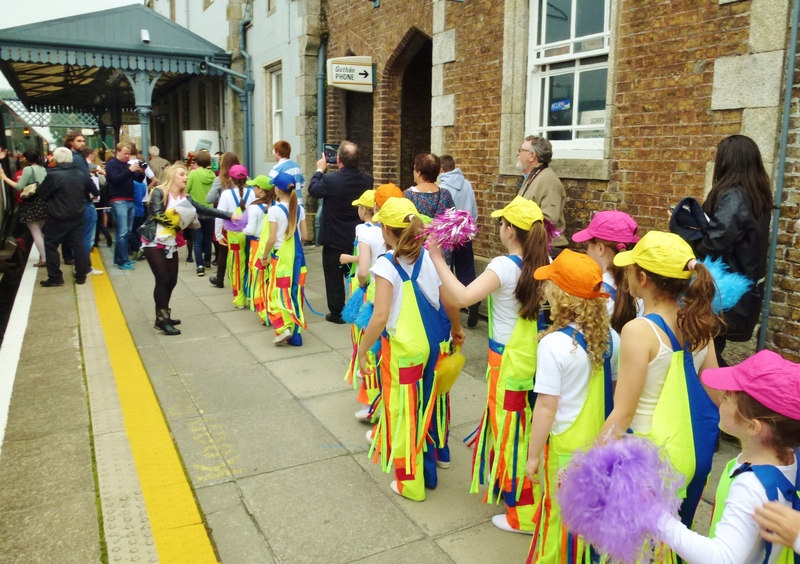 Hundreds of schoolchildren and supporters lined the station car park and poured out onto the streets to cheer the musicians. One banner read ‘Thank you for the music’. The Kill Singers from County Kildare serenaded the arrivals with “Chattanooga Choo Choo”, which had also been performed on board in style by the Bugle Babes. 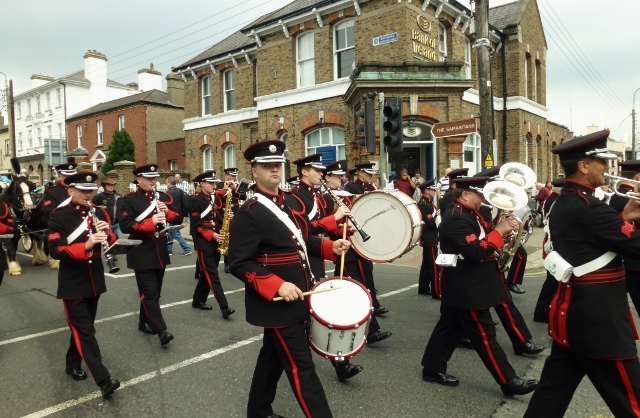 Numerous local bands including the Scoil na Naomh Uilig band played as the musicians and singers lined up for a parade into town headed by the Army No.1 Band from Cathal Brugha Barracks in Dublin. On Saturday they will be appearing at the National Concert Hall in Dublin at the Defence Forces Benefit Concert, which is sold out. Soprano Celine Byrne who was also in Newbridge will be making a guest appearance. I notice she is also coming to the Waterfront Hall in Belfast on October 17th to sing alongside José Carreras in the opening night of the Belfast Festival at Queen’s. “What a way to arrive into my hometown of Newbridge,” singer Luka Bloom told the Leinster Leader. He was joined on the platform by fellow musician and friend Philip King. “What a thrill. I was at Connolly Station at 8am this morning [Monday 1st October] and what a way to spend a Monday. There was a lot of singing on the train”. 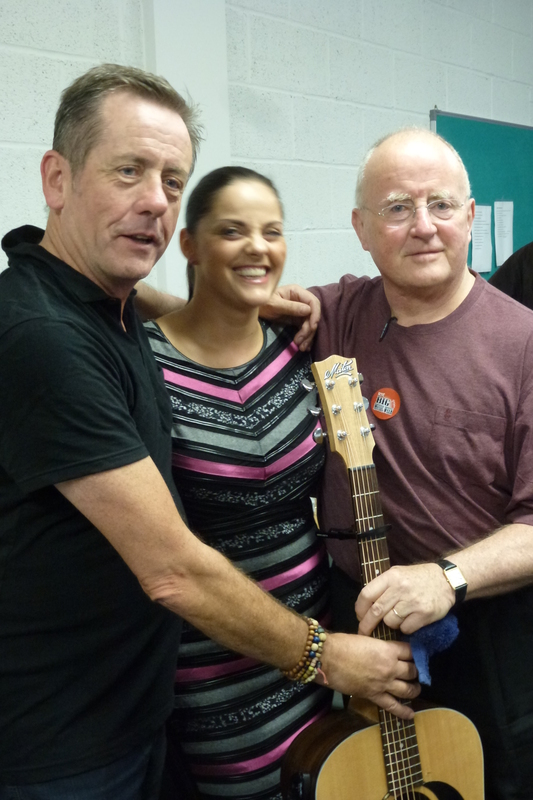 At the Patrician Secondary School, Luka Bloom’s brother Christy Moore was waiting at his alma mater. Luka sang a song he had written for his good friends the Brigidine Sisters in Kildare Town called ‘Don’t be afraid of the light within you’. 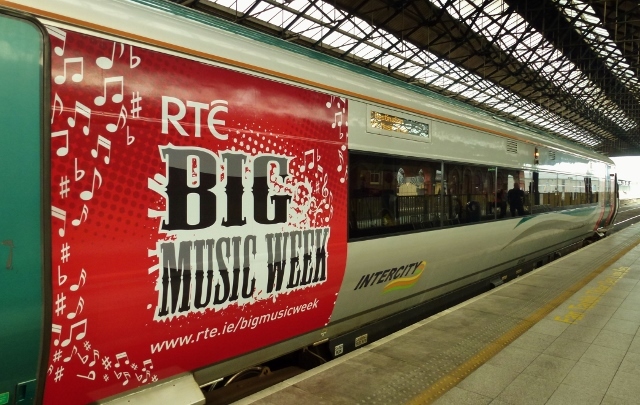 RTÉ’s Big Music Week was run in association with Iarnród Éireann, which provided a three carriage ICR train for the musicians and their guests. 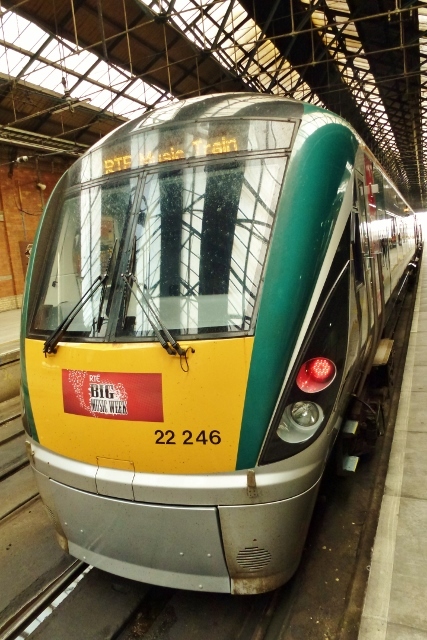 The 22000 Class “InterCity Railcar” is a diesel multiple unit usually used on commuter routes such as Kildare, Portlaoise and Longford to Dublin and on Irish Rail’s intercity routes except Dublin to Belfast (served by the Enterprise) and peak-time journeys from Dublin to Cork. There are 48 of them and they can seat 190 passengers. They are capable of speeds up to 160 km/h (100 mph). The sets were supplied by Mitsui of Japan in an order totalling approximately €400 million. The fleet was built by a partnership between Hyundai Rotem of South Korea and Tokyu Car Corporation of Japan, who supplied the bogies. The first sets were delivered in March 2007. Two of the 3-car sets, 22010 and 22011, which arrived in July 2007, suffered corrosion damage in transit from South Korea. They were returned to Rotem for repair in October 2008, with a revised delivery date. It was later determined that it was uneconomic to repair them and two replacement units with the same numbers were provided at no cost to Iarnród Éireann. The ICRs are divided into three car sets and six car sets, and have two internal configurations. The first 30 units are all three cars, and are all intended for use on Intercity routes, as are ten of the 15 six car units. 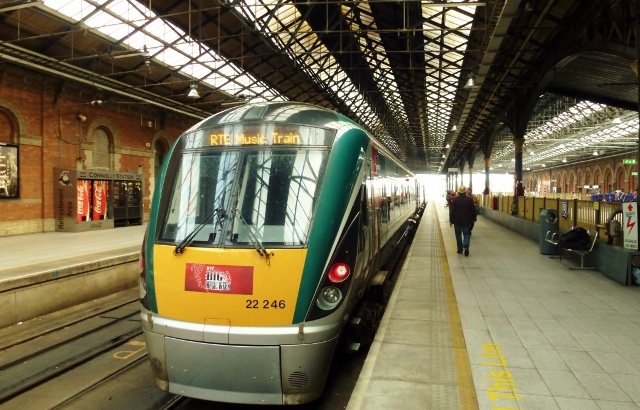 The remaining five 6-car sets, plus the 17 three car sets ordered in 2008 are configured for long-range commuter services to and from Dublin. Combinations of two 3-car sets, three 3-car sets, two 6-car sets and a 3-car set + a 6-car set are possible. In case of emergency, they can operate in formations of up to 18 cars. Engine: MTU 6H 1800 R83, 12.8 L, 6 cylinder, 483 bhp gross, 386 bhp (288 kW) traction per car. 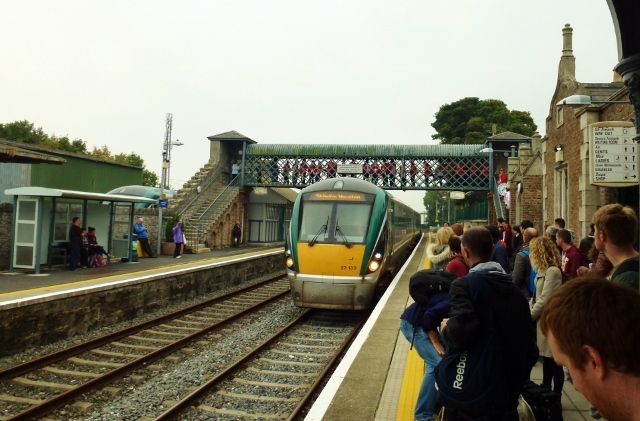 All sets feature Irish standard CAWS signalling systems and train radio. The first six 3-car sets fitted with Train Protection and Warning System for operation on Northern Ireland Railways. The RTÉ Big Music Week ended on a high note with a special concert at the Vicar Street theatre in Dublin on behalf of the childrens’ charity Barnardos. Presented by Kathryn Thomas it featured some top names from a wide variety of musical styles, including the Irish chart topper who outsold Avici and Katy Perry just a month ago, Finbar Furey. Finbar is the recent winner of the TV show The Hit and performed his recent number one song The Last Great Love Song plus some of his songs from five decades. Also on the bill for the night was trad legend Sharon Shannon and Paul Walsh from Royseven whose song We Should Be Lovers was the most played song on radio in Ireland in 2011. The enigmatic Jerry Fish will also be re-creating his most famous song True Friends in collaboration with The Lost Brothers. Other well known acts performing at this charity event include The Heathers, Scullion, Robbie Overson and Philip King. The show also featured a brand new song written by Brendan Graham and performed by Eimear Quinn, Celine Byrne and others which was premiered on The Late Late Show last night. It has been released as a single in aid of Barnardos. 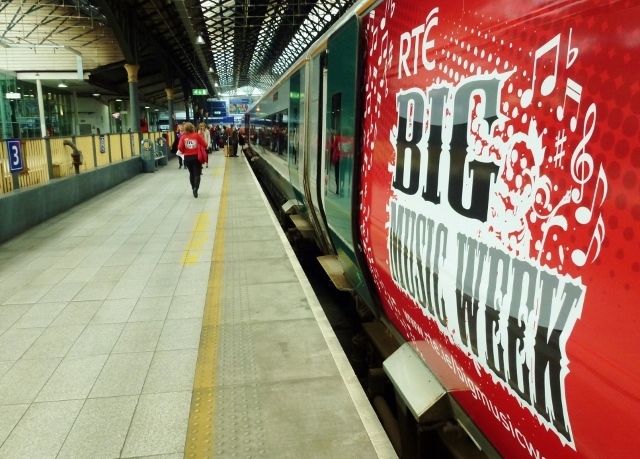 Another busy day for the RTÉ Big Music promotion in association with Iarnród Eireann. 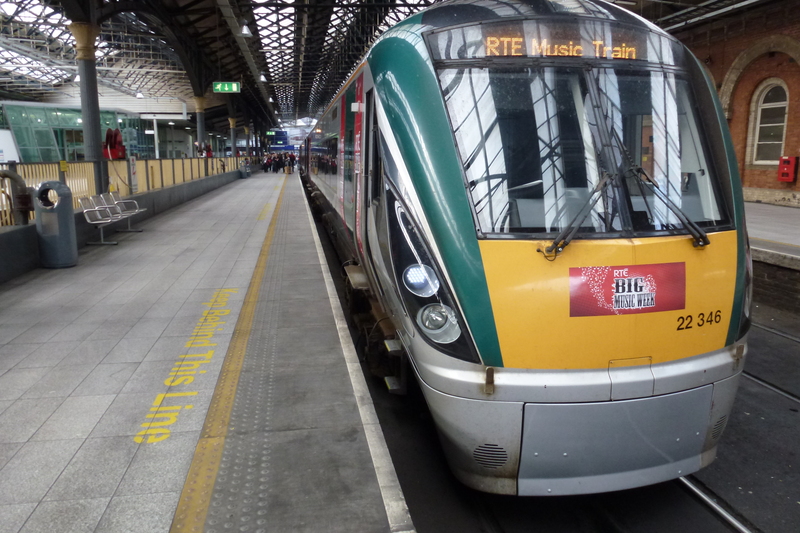 Here is today’s schedule of broadcasts on radio and television: remember to watch the Late Late Show tonight with Ryan Tubridy as the train arrives back at Connolly station in Dublin. 21:35 RTÉ One The Late Late Show As the RTÉ Big Music Week Train pulls back in to Connolly Station following an epic week, the RTÉ Concert Orchestra and the RTÉ Big Music Week House Band gather in studio for a one-off live performance of Irish song-writer Brendan Graham’s RTÉ Big Music Week song. Featuring some of Ireland’s biggest and best vocalists and musicians. The RTÉ Concert Orchestra & the RTÉ Big Music Week Train House Band with some of Ireland’s best vocalists and musical contributions collected throughout the week. 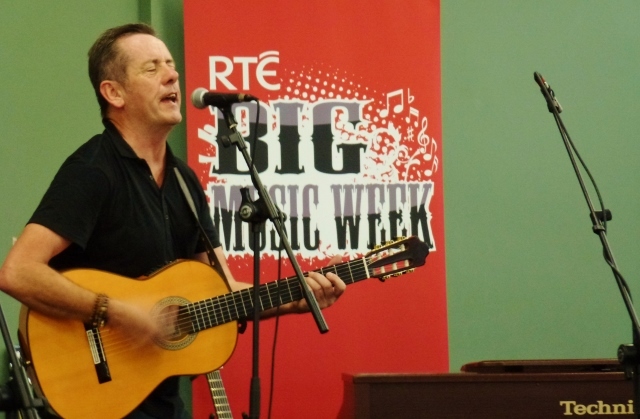 Day four of the RTÉ Big Music Week which began in Westport County Mayo with Marty Whelan live on Lyric FM with Declan O’Rourke, Brendan Graham, Laoise Kelly and other artists. 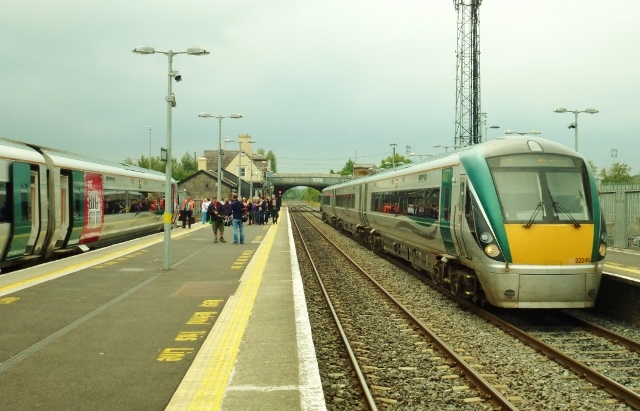 The train then moved on to Carrick-on-Shannon in County Leitrim for a concert tonight at the Landmark Hotel with Robert Mizzell, Louise Morrissey and Patrick Feeney. 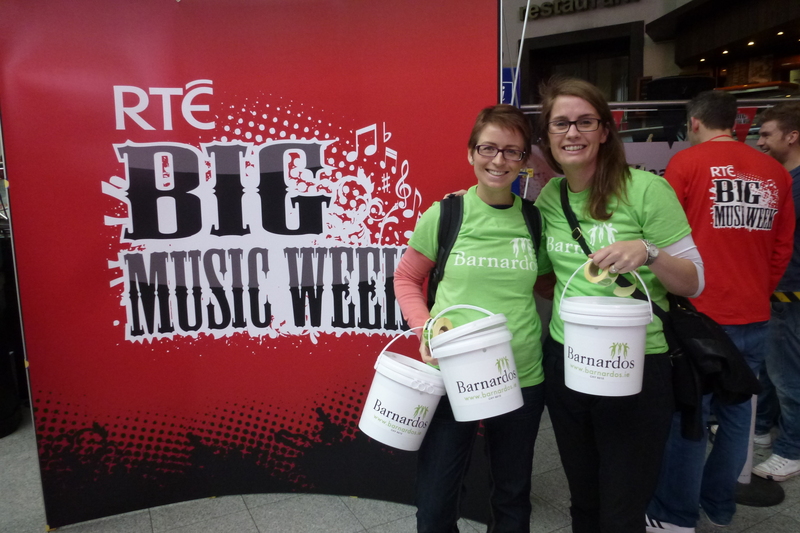 On Saturday a charity concert for Barnardos will be held at Vicar Street in Dublin to bring the week to a conclusion.